This is the latest in my TTSH build series – see what you’ve missed here. If you’re following me on Instagram (and if you’re not, why aren’t you?) you may have seen some video evidence of my TTSH making noise. All components are in place, preliminary calibration has been done (pitch is tracking nicely) and we’re really pretty darned close to having a working TTSH on our hands. 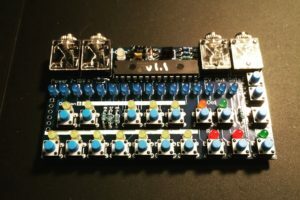 I’m using a Division 6 Business Card Sequencer as a CV source in that example; it’s another DIY kit that does pretty much what it says on the tin – 16-note step sequencer and also doubles as a micro-keyboard in a pinch. The TTSH doesn’t come with a keyboard, and there wouldn’t be much point to replicating the original. ARP did make a sequencer for the 2600, the 1601. I had custody of one for a while, and found it kind of bulky and not particularly versatile. There is a 1601 clone available as a DIY project as well, but it’s for purists only if you ask me. I’m now working on a cabinet, with generous help from a luthier friend because I don’t have a wood shop on premises and wouldn’t really know what to do in one if I did. It should be finished within a week or so. I’ll leave the remaining calibration until that’s done, as several of the trimmers are only accessible from the back and it will be much easier to work with once it’s mounted vertically. With the workspace freed up somewhat it made sense to take care of the spare filter board, the “post lawsuit” 4072. It went pretty quickly. I seem to be short a few capacitors, which is puzzling, but I’m not in a great rush to try it out so that’s not a big deal. 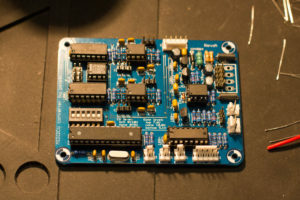 Energized by how quickly that comparatively small board got stuffed, I decided to move on to the Midi2CV board. Some form of MIDI interface is a must-have if you want to connect a modern digital keyboard to an anlogue synth. I settled on Peter Kvitek’s Midi2CV Mk2 as it seemed like a pretty full-featured option. It was a quick build, and it will enable me to run the TTSH off of any MIDI synth or sequencer in the studio. I’m thinking it will pair nicely with the Moog Sub 37. Not sure why I put a Euro header on the MIDI/CV interface. Habit. After that’s done there are a few more modifications that have been recommended to me to improve performance and interoperability with other instruments and my modular system. 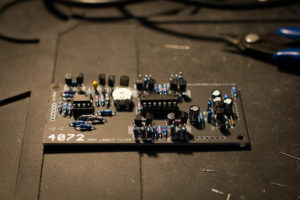 So stay tuned for more, and hopefully in the next installment we’ll have something very much like a finished synthesizer for you to look at.